I love sleeping. I've been good at it since I was a baby according to my mom. Husband will tell you the same. If I'm horizontal, I'll probably fall asleep. Here I am napping with my Westie. I'm sure I was sleeping through a NASCAR race or some other sporting event designed to lull ladies to sleep on a Sunday afternoon. Don't you love how he took the time and effort to take a panoramic shot of me and Westie snoozing? Given this, my proclivity for sleeping, I suspect this is where my obsession with bedding stems. I can't get enough of it - much like sleep. I noticed this obsession in college when each year I thought I needed to have an entirely new set of bedding for my dorm room. I know I had 2 different duvets Freshmen and Sophomore year, but I somehow managed to use the same Tommy Hilfiger comforter Junior and Senior year. I know, I'm astonished myself. After college, and upon getting my first job, I got my first apartment. A charming 1949, 700 square foot, story-and-a-half townhouse in Cameron Village. I had the tiniest of kitchens, no dishwasher, no central A/C (just 2 HUGE wall units - one up, one down), but I did have lovely hardwood floors both upstairs and down. The entire upstairs (minus the tiny bathroom) was my bedroom - and it was huge. I brought in my bed from my parent's house as well as the bedding. I painted the room to match and it ended up being almost the identical color as my childhood bedroom. It didn't take long until I decided I wanted new bedding. I don't remember what triggered it, but I remember getting the duvet and shams plus the cutest little quilt to lay at the foot of the bed, and I remember thinking how designer my bed looked. It wasn't - it was a red/white check duvet. But it was cute and fun and I loved it! From that point on, I just couldn't buy enough bedding. Mostly I bought sheets of various patterns and colors and thread counts. From jersey knit to sateen to cotton. It was fun and a semi-inexpensive way to make my bed feel new without replacing the entire duvet. Back to my point. I love bedding and I swore not too long ago that I was going to stick with the cute and comfy IKEA bedding that's on our bed now. In fact, there is an IKEA duvet + shams AND an IKEA quilt + 2 Euro shams on the bed all at one time. I'm out of control. 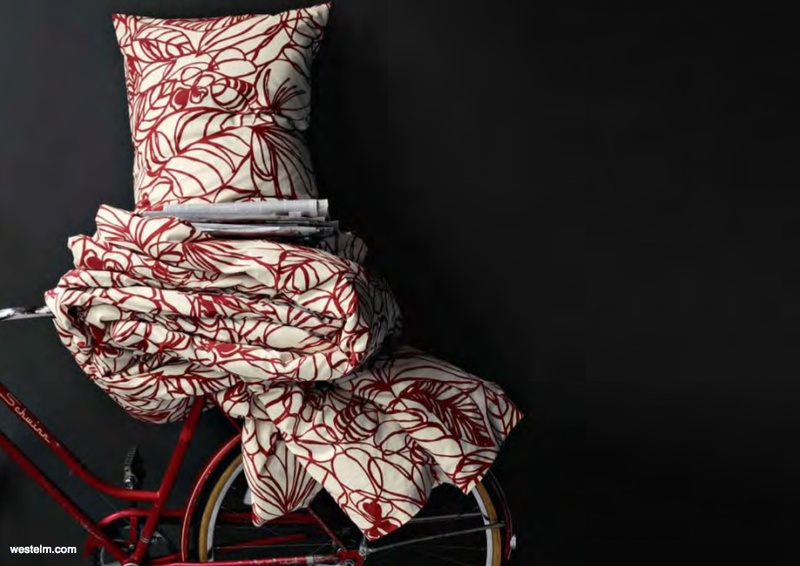 But then I saw the West Elm Fall Preview on Elements of Style and I fell in love with another duvet. 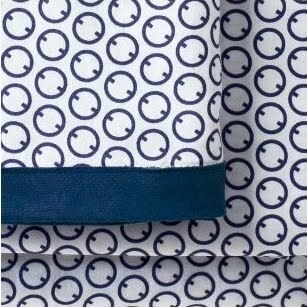 Here's a peek: And to that I say I need both of these sheet sets from Serena & Lily because I love putting patterns together and both of these would be so fun to wallow on. 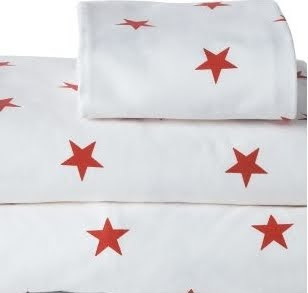 Lapis French Ring sheets: Red Star sheets: So cute, so fun, so colorful. My master bedroom is up next on my list of rooms to start working on in addition to my downstairs bathroom. I love having red in my bedroom. Among all the bedding I've ever bought, a lot of it has big punches of red and although they say red evokes feelings of anger and it's not always good to have red in the bedroom, I love it. I don't put it on the walls, it's in pillows and rugs and quilts. It makes me happy and gives the room some warmth. I want to bring in navy or a royal blue to the room, too. Hence the Lapis French Ring sheet. The rings on the sheets echo the loose rings in the duvet and I love the colors together.